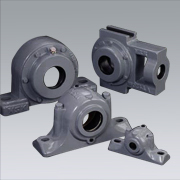 Plummer block housings can be used with high-capacity spherical roller bearings or self-aligning ball bearings. They are manufactured from high-strength cast iron as standard but are also available in cast steel or spheroidal graphite cast iron. The housings have a re-lubrication facility and can be used with either oil or grease lubrication. Sealing options – NSK offers a range of sealing options including oil seals, labyrinth seals, or heavy-duty taconite seals. Case end covers are available. Multi-relubrication points are provided to ensure relubrication of the bearing depending on orientation. Housing are supplied with spacer rings in order to provide axial location. Those can be omitted for “free end” axial front. SN5 and SN6 types are the most common type, which are provided for in JIS B 1551, ISO 113/II, and DIN736, 737. SN30 and SN31 types are medium size and their shaft diameters are bigger than that of SN5 and SN6 types. For these types, a bearing is mounted with the use of an adapter. These are large size and for heavy-duty application. They have dual structure oil seals. For these types, a bearing is mounted with the use of an adapter. This is a dustproof type, and this was developed by NSK. It has a combination of oil seals, labyrinth seals, and oil groove seals; therefore, it is suitable for environments with dust and other foreign matters. For this type, a bearing is mounted with the use of an adapter. SN2C and SN3C are the types that the bore diameter of one side is smaller than that of SNa2 and SN3 respectively, and they are provided for in JIS B 1551. For these types, a bearing is mounted with the use of a nut and washer.